The Pulwama attack swung the strobe lights back on national security. And defence is all about capability — machines, hardware and software. A report laid in Parliament by the Comptroller and Auditor General of India in 2017 had pointed out that the stock of 61 types of critical ammunition needed to fight a war by the Indian Army would last only ten days. 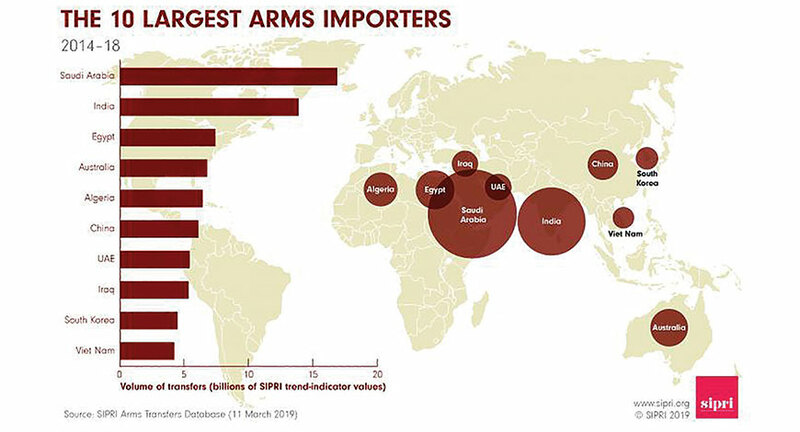 India continues to purchase 70 per cent of its military hardware from the global market (See graph: The 10 Largest Arms Importers). A report by the Federation of Indian Chambers of Commerce and Industry (FICCI) and financial services firm Centrum Capital says the country’s defence spending is expected to swell to $620 billion (Rs 38 lakh crore) by 2022. Even sub areas in the aerospace and defence (A & D) electronics space could throw up opportunities for $72 billion worth of projects over the next ten years, according to a Nasscom study. Prime Minister Narendra Modi has announced a $250 billion military modernisation plan. Jayant Patil, Senior Executive Vice President for L&T’s Defence Business has spearheaded the company’s foray into the defence sector since private participation in defence production was allowed in 2001. Patil estimates the cumulative anticipated capital expenditure (CAPEX) for building the requisite defence infrastructure to be around Rs 15 lakh crore over the next ten years. He believes the Indian government’s initiative to indigenise defence manufacturing could open up opportunities worth lakhs of crores over the coming decade (See interview: ‘The defence industry can lead the next phase of industrial growth’). India plans to increase indigenous production of military hardware from roughly 35 per cent now to around 70 per cent over the coming ten years. The volume of domestic defence production could then shoot up to Rs 1.7 lakh crore from Rs 25,000 crore now. “With its multiplier effect, this could create a staggering addition of Rs 65 lakh crore to Rs 75 lakh crore to the Indian economy (more than two per cent of the GDP), generating more than five lakh new highly skilled jobs,” says Patil. The Make in India program for defence manufacturing aims to rope in both global heavyweights and domestic firms, but has made little progress. Sadly, defence as an industry is still mired in rhetoric that seldom translates into action. Private sector participation has remained part of the rhetoric over the last two decades, but companies like L&T have treaded gently on new territory, finding no level playing field with the defence public sector undertakings (DPSUs). L&T has invested in and developed advanced defence platforms, but feels that it is treated as an alternative to the DPSUs. “The SP (strategic partnership) model was intended to bring in private sector participation in addition to production lines in the DPSUs for manufacturing defence platforms within the country,” points out Patil. “Even this is on the verge of being diluted to allow the public sector to participate in strategic partnership programmes in favour of absence of cost benchmarks and price discovery,” he goes on to say. Maj. Gen. Asthana emphasises that it was important for decision makers to view defence manufacturing as a money spinner. After meeting the requirements of the Indian security forces, the industry should aim to capture a major share of the Asian market by 2035 and the global market progressively by 2047 — which incidentally, will be the centenary of India’s Independence. He points out that the United States, China and many European nations earn considerable foreign exchange from exports of military hardware. Policy blues that have tripped up private sector participation in defence production include absence of a final and concrete Defence Production Policy (DPP) and set guidelines for offsets. The evolution of the defence policy framework has also taken too long and the existing rule book still lacks operational clarity. “A policy framework has been there and good progress has been made in this regard,” admits Ashok Leyland’s Defence Head Amandeep Singh. “However,” he adds, “implementation at the operating level, keeping the spirit of policy changes in the forefront, has to be hastened.” (See interview: “The defence industry has the potential to become the next IT”). Singh points out that the defence business has a unique risk — the single buyer risk. In defence, other markets only open up, he says, when you have a domestically proven and used product. A classic example is the Tejas, in which Malaysia has shown interest. The multirole light combat aircraft (LCA), developed indigenously by Hindustan Aeronautics (HAL) and the Aeronautical Development Agency (ADA), was recently on display at the Langkawi International Maritime and Aerospace Exhibition in Malaysia. On home ground, though, the Indian Air Force took a long while to induct the fighter jets into its fleet. Singh says hand holding is necessary in defence. “We have the capability to overcome the investment, technology gap and other challenges,” he says, adding, “However, government hand holding in the form of certain and time-bound purchases is a must to mitigate the single buyer risk.” He calls for crucial inputs and support from the government for the private sector, which has to make a “heavy investment” to participate in defence production. In 2017 China spent close to 20 per cent of its defence outlay on research and development (R&D), when India spent a mere six per cent of its defence outlay or less. The 2019-20 budgetary allocation for defence was Rs 19,021 crore, of which Rs 8,537 crore was marked for revenue and only about Rs 10,484 crore for capital expenditure. “If we further adjust the amount with the inflation index for manufacturing, the real value of funds allocated for FY20 is equivalent to the defence budget allocated in the pre-GST era i.e. FY16-17,” points out Patil. “If one goes by the recent statements by the finance minister, the government is seized of the need for enhancing defence budgets and the structural changes made in the tax regimes to strengthen the Indian economy promise the ability to do so over coming years,” says Patil. The defence sector in India is guided by a lone soldier, the Defence Research and Development Organisation (DRDO) under the Ministry of Defence (MoD), known for its delays and failures. In comparison, the United States’ Federally Funded Research and Development Centres (FFRDC) owns 42 R&D centres. These public-private partnerships engage in research for the US government under its sponsorship. Most of them are engaged with universities, industrial firms and are kept outside the ambit of the government. The corporate sector has scant fiscal incentives for investing in R&D, however, which could be a hurdle in targeting Make-2 programmes for indigenising major systems and subsystems of military platforms. The industry is looking toward MoD for directed incentivisation of R&D on a long-term basis, with weighted tax deduction for instance. “Transformative measures have been enabled. What is required is a follow through by periodic incremental facilitation by the MoD to build a strong defence industrial base and an ecosystem across industry tiers in India,” says Patil. The process, he emphasises, would “empower strategic independence, enhance the GDP and create new jobs to put to gainful use India’s demographic dividend”. Should the wrinkles in private sector participation in defence production be ironed out, defence could indeed be the game changer the Indian economy needs.